English : What is STD? This World AIDS Day lets raise awareness about it! Wire-tailed swallow, Hirundo smithii, feeding the offspring. English : Wire-tailed swallow, Hirundo smithii, feeding the offspring. English : Yawning kitten at Kuban. English : The downhill skiing on the mountain Grintovec Kamnik–Savinja Alps, Slovenia, May 2014. "Umschreibung" is an art installation by Olafur Eliasson in Munich. Here the spiral stairs are seen from below at night. English : "Umschreibung" is an art installation by Olafur Eliasson in Munich. Here the spiral stairs are seen from below at night. English : Timelapse video of the 3D printing of the hyperboloid. English : Video of the Niagara Falls from the boat, May 2006. Panoramic view of Pulkovo Airport in Saint Petersburg, Russia. English : Panoramic view of Pulkovo Airport in Saint Petersburg, Russia. English : Aerial video of the Antonivski bridge in the city of Kherson, southern Ukraine September 2017. English : Aerial video of Troldhaugen, the Norwegian composer Edvard Grieg's home, now the composer's museum wiht the concerthall Troldsalen, Norway, June 2017. Großhadern is a Munich U-Bahn station on the U6, opened in 1993. English : Großhadern is a Munich U-Bahn station on the U6, opened in 1993. English : Scandlines - hybrid ferries, ships Berlin and Copenhagen on the Baltic Sea. Orthetrum luzonicum, Tricolored Marsh Hawk, is a medium sized dragonfly with blue, yellow and brown markings. This is a juvenile male. English : Orthetrum luzonicum, Tricolored Marsh Hawk, is a medium sized dragonfly with blue, yellow and brown markings. This is a juvenile male. English : Accelerated video of the caterpillar of butterfly Papilio machaon eating the green leaves. X-ray crystallography is a tool used for identifying the atomic and molecular structure of a crystal. The movement of the machine during 80 second scan can give different view on how relatively slow scientific measurements can look frozen in time by shutter speed of 90 seconds. English : X-ray crystallography is a tool used for identifying the atomic and molecular structure of a crystal. The movement of the machine during 80 second scan can give different view on how relatively slow scientific measurements can look frozen in time by shutter speed of 90 seconds. English : Scrub Me Mama with a Boogie Beat is a 1941 American cartoon directed by Walter Lantz. Night view of Berlin Hauptbahnhof (English: Berlin Central Station), main railway station in Berlin, Germany. The station came into full operation in May 2006 and is located on the site of the historic Lehrter Bahnhof, which was opened in 1871 as the terminus of the railway linking Berlin with Lehrte (location near Hanover), which later became Germany's most important east-west main line. In 1987, it was extensively renovated to commemorate Berlin's 750th anniversary, and again in 2006 to its current appearance. English : Night view of Berlin Hauptbahnhof (English: Berlin Central Station), main railway station in Berlin, Germany. The station came into full operation in May 2006 and is located on the site of the historic Lehrter Bahnhof, which was opened in 1871 as the terminus of the railway linking Berlin with Lehrte (location near Hanover), which later became Germany's most important east-west main line. In 1987, it was extensively renovated to commemorate Berlin's 750th anniversary, and again in 2006 to its current appearance. Malachite kingfisher (Corythornis cristatus) on Lake Baringo, Kenya. To celebrate Jamhuri Day which marks Kenya's establishment as a republic on 12 December 1964. 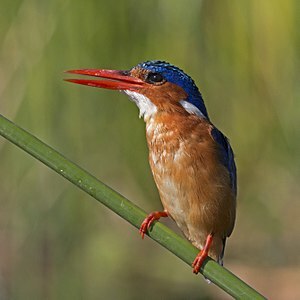 English : Malachite kingfisher (Corythornis cristatus) on Lake Baringo, Kenya. To celebrate Jamhuri Day which marks Kenya's establishment as a republic on 12 December 1964. English : Popping pod (Ruellia tuberosa) cracks in water with a popping sound. Two Soviet MiG-29 aircraft en route to an air show in British Columbia, Canada, are intercepted by F-15 Eagle aircraft of the 21st Tactical Fighter Wing. The Soviet MiG-29s are, for the first time, traveling to the Abbotsford International Airshow in Abbotsford, BC, Canada, to participate in the August 1989 airshow. The USAF F-15 Eagle interceptors actively guarding North American and United States of America's airspace are with the 21st Tactical Fighter Wing, headquartered at Elmendorf Air Force Base (AFB), Alaska, USA. English : Two Soviet MiG-29 aircraft en route to an air show in British Columbia, Canada, are intercepted by F-15 Eagle aircraft of the 21st Tactical Fighter Wing. The Soviet MiG-29s are, for the first time, traveling to the Abbotsford International Airshow in Abbotsford, BC, Canada, to participate in the August 1989 airshow. The USAF F-15 Eagle interceptors actively guarding North American and United States of America's airspace are with the 21st Tactical Fighter Wing, headquartered at Elmendorf Air Force Base (AFB), Alaska, USA. English : A Story of Tobacco is a 1926 Japanese short cartoon by Noburō Ōfuji. First sunbeams sweep over a winter landscape. Path between Put van Nederhorst and Langweerderwielen. Location, Langweerderwielen (Langwarder Wielen) and surroundings, De Fryske Marren, Friesland, Netherlands. English : First sunbeams sweep over a winter landscape. Path between Put van Nederhorst and Langweerderwielen. Location, Langweerderwielen (Langwarder Wielen) and surroundings, De Fryske Marren, Friesland, Netherlands. English : Pied kingfisher (Ceryle rudis rudis) eating a fish at Mankwe dam in Pilanesberg Game Reserve, South Africa. Fog and frost on the Lysekil railway at Gåseberg in Lysekil Municipality, Sweden. The railway was inaugurated in 1913 and is still in use. English : Fog and frost on the Lysekil railway at Gåseberg in Lysekil Municipality, Sweden. The railway was inaugurated in 1913 and is still in use. English : The high-speed rail trains Shinkansen (series E2, E3, E4, E5, E6 and H5) in Japan, 2010-2016. English : Taiwan, Lioujia (Tainan City): tanbo art composition showing a copy of "The Gleaners", a painting of the french artist Jean-François Millet, and a Q-version of the buddhist goddess Guanyin. Golden-mantled Ground Squirrel (Spermophilus lateralis), Bryce Canyon, Utah (USA). 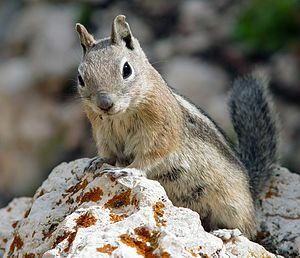 English : Golden-mantled Ground Squirrel (Spermophilus lateralis), Bryce Canyon, Utah (USA). English : An Indian palm squirrel or three-striped palm squirrel (Funambulus palmarum) eating rice, 2014. Main reredos of the Chapel of the Rosary in St Domingo church in the Historic Center of Quito, Ecuador. The catholic temple was constructed between 1540 and 1688 following the plans of architect Francisco Becerra. The baroque chapel, dedicated to Our Lady of the Rosary, is the most featurable in the church and was painted by priest Pedro Bedón at the beginning of the 17th century. English : Main reredos of the Chapel of the Rosary in St Domingo church in the Historic Center of Quito, Ecuador. The catholic temple was constructed between 1540 and 1688 following the plans of architect Francisco Becerra. The baroque chapel, dedicated to Our Lady of the Rosary, is the most featurable in the church and was painted by priest Pedro Bedón at the beginning of the 17th century. English : The detailed images of the Sun surface recorded by the Solar Dynamics Observatory (SDO) over the one year period, 2012. English : Video of the blizzard in Chicago, United States, February 2011. Aurora australis dancing over an LED illuminated igloo giving a blue tinge to the color of snow. English : Aurora australis dancing over an LED illuminated igloo giving a blue tinge to the color of snow. English : Diving around the ship wreck near Land's End in Cabo San Lucas, Mexico on January 11, 2016. Video shows yellow goatfish (Mulloidichthys martinicus), blue-and-gold snappers (Lutjanus viridis) and Chinese trumpetfish (Aulostomus chinensis). English : Video about growing, harvesting and preparation of food from soybeans in Tuensang district, Nagaland, Northeast India. The second horse is inside the building and in the background from this angle. English : The Insects' Christmas is a 1913 Russian short animated film directed by Wladyslaw Starewicz. Union Square, San Francisco is a public plaza. Here, it is decorated for Christmas with a skating rink and a Christmas tree. This view is from the public rooftop terrace at the flagship store of Macy's West. English : Union Square, San Francisco is a public plaza. Here, it is decorated for Christmas with a skating rink and a Christmas tree. This view is from the public rooftop terrace at the flagship store of Macy's West. English : An aerial recording, taken using a DJI Phantom 2 Vision+ V3 drone, of Swiss Camp, Greenland. Nativity of Christ at the winged altar of the parish- and pilgrimage church Kefermarkt, Upper Austria. Anonymous master (Master of the Kefermarkt Altarpiece), around 1497. English : Nativity of Christ at the winged altar of the parish- and pilgrimage church Kefermarkt, Upper Austria. Anonymous master (Master of the Kefermarkt Altarpiece), around 1497. English : 30% of very poor children live in India:Unicef. Let's dedicate this Christmas🎄 to those un noticed future of India. English : Video from the Museum Steam Trains at the Loughborough station, England January 2017. Snowboarder Sergey Lapushkin at Slopestyle LG/FIS World Cup 2012, Stoneham ski resort, Quebec, Canada. English : Snowboarder Sergey Lapushkin at Slopestyle LG/FIS World Cup 2012, Stoneham ski resort, Quebec, Canada. English : Video from Danza de los Voladores (Dance of the Flyers) performed at Discover Mexico Cultural Park, island Cozumel, Mexico, November 2017. 2 x Saab JAS-39 Gripen and 2 x Aero L-159 of the Czech Air Force, based at AFB Čáslav, inflight. English : 2 x Saab JAS-39 Gripen and 2 x Aero L-159 of the Czech Air Force, based at AFB Čáslav, inflight. English : Video of Apollo 11 engines during launch on 16th July 1969 from the Mobile Launcher. This footage takes place within approximately 30 seconds, camera E-8 captured on 16 mm film at 500 frames per second. English : The video of the plasma globe. A juvenile green monkey (Chlorocebus sabaeus) from The Gambia. English : A juvenile green monkey (Chlorocebus sabaeus) from The Gambia. English : The monkeys Crab-eating macaque (Macaca fascicularis) cleaning their youngs in the nature reserve Ubud Monkey Forest, Bali, Indonesia. English : The Lunar New Year celebrations fireworks in New York, United States, February 2003.